← Mercury stations – enter domestic mayhem! Astrology: is it a descriptive or a predictive art? A consequence of a period of exceptional fogginess and disruption was that I missed a very important anniversary. Two years ago, on 1st of June 2013, was the date of my first post on Astrology: Questions and Answers. This new blog was birthed in May 2013 on a page on Glasgow, Scotland,UK’s popular West End Website, a brilliant local community resource. However, the response via questions and comments was so positive that I decided to set up a whole blog dedicated to Astrology Questions and Answers. Here, then, to celebrate our second anniversary, is the very first question, which is having its very first airing on this site, having first appeared on the West End Website. Enjoy, and many thanks to all you readers, commenters, emailers and questioners for making those first two years such fun! 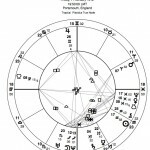 A properly drawn up horoscope using your date, place, and time of birth can allow me to provide you with a clear description of the characters who are acting out the play of your particular life, to use a familiar but useful analogy.The Sun represents only one character, thereby revealing right away how limited popular Sun Sign astrology is. The other characters are represented by the Moon, Mercury, Venus, Mars, Jupiter, Saturn, Uranus, Neptune and Pluto (for latest on this contested planet’s status, click HERE ). Thus, as an astrologer, I am working with explaining and discussing a number of different levels of manifestation which can and do arise from each symbol. Your birth horoscope is determined by your date, place and time of birth – factors over which we apparently have no control. This can be seen as the fated dimension. But what you do with those energies depends to a considerable degree (impossible to work out exactly – no wonder reductionist science finds astrology so provoking!) on the levels of conscious self awareness you bring to the choices you make as life unfolds. Therein free will probably lies…. A simplified example: Venus in your natal horoscope represents relationship(s). The planet Uranus represents the urge to break down old patterns and is unpredictable, disruptive in its impact. If this planet is going to be exactly engaging with your natal Venus, eg for the whole of 2015, then I think you can work out without me telling you that this will not be the most peaceful uneventful year in your relationship life! Personally, I think it is sufficient to describe the core manifestation of a planet’s impact, and work with the person regarding how best to use this information. A concluding observation on prediction. It is an inexact pursuit for all who attempt it, from economists through weather forecasters through astrologers.The latter failed to spot that World War Two was about to break out, for example, although there are many examples of astrologers delivering exactly the right level at which energies would manifest (ask google about this, especially the famous prediction about the death of Henry the Second of France….). Modern science teaches us that we live in a universe which conducts a great dance between order and chaos, where probability and indeterminacy, not exactitude, are the order of the day. I like that! This entry was posted in Astrology: challenges, ethics and practice (11 articles) and tagged Astrology, astrology and quantum physics, horoscope, Planets in astrology, Sun sign astrology, Zodiac. Bookmark the permalink. Happy Anniversary! Thank you for sharing… “But one can only speculate about the level of manifestation of those energies….” Hear! Hear! I find it interesting that it’s my clients who expect fortunetelling. You are welcome, Leslie. I probably lose a certain number of potential clients by adopting this approach, but that does not bother me. It has meant that the folk who come my way are usually a good “fit”, and the outcome of our meeting is nearly always positive and constructive for both of us as a result. I enjoy your writing – little lights go on in my brain giving me “aha” moments. I’ve dabbled in astrology since I was about 22 or so – very superficial understanding of the art. The older I get, I find I want to deepen to my understanding of astrology because it feels comfortable as a language – a way of talking to myself about my self, if that makes any sense! Of course it is! As you will see in the post, I’m being deliberately dualist just to get people going – and thinking… Thanks for commenting, Kathy! 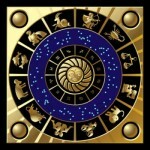 I noticed recently that astrology can be predictive in its descriptiveness. I looked at the birth chart for Princess Charlotte soon after she was born and then wrote up my analysis of the factors in her chart. I did not really mean for this to be predictive as such, but I realised that my (publicly posted) conclusions about her chart are either right or wrong (and only time will tell), and therefore are predictive in their descriptiveness. I hardly can believe two years have passed. I’ve learned so much from you in that time. Your blogs are literate, interesting, and thought-provoking. Given that description, I predict increasing popularity and a long, healthy run! Well, Linda, I am indeed delighted with this comment from you – especially since yours was the first question I posted on the West End Website blog page! I’ve truly appreciated your support throughout . Many thanks. Congratulations! I’ve only been reading off an on but I always seem to make my way back after a long absence. I enjoy your writing and hope to see more! Many thanks for this affirming comment, msfullroller. Much appreciated.